Stop that! You’re too nice to your characters. The Grinch is despicable and you know it. Did you create nice, wonderful characters? Too bad for you! No one will read it. Take a page from Dr. Seuss. Be nasty when you create characters. Try different physical descriptions, motivations, typical ways of moving, common phrases and specific actions. Whoville. What kind of name is that for a town? A memorable one. And the Whos are memorable. Dr. Suess was a genius at creating fictional worlds that are believable. Take another look at your setting: create a town, populate the town with a mayor, a teacher, families. Now, write a story set in that town. The Grinch ties his best to ruin Christmas by stealing every THING that relates to Christmas. Things become worse and worse for the Whos. Make sure that you intensify the conflict of your story. No one will read boring, nothing-happens stories. Burn this into your sense of story: without bad things happening, there is no story. 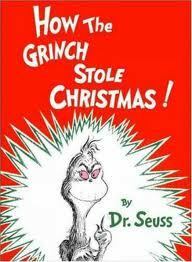 Dr. Seuss intensifies the dilemma by having the Grinch do every despicable thing possible to ruin Christmas. Popular book for over 50 years! Dr. Seuss did not try to avoid the blackest moment and neither should you. What is the absolute worst thing that could happen to your characters? Make it happen. Be a Grinch, be nasty. At the end, the Grinch’s heart grows two sizes larger. It’s a poignant moment of clear character growth and change. The metaphoric becomes concrete. Draw two columns down a page and label the columns, Before and After. In the Before column, write details of your character in the story’s opening. In the After column, write details of your character in the story’s ending. Make sure there is a sharp difference, a big change. If there isn’t, what changes make sense in the context of the story. Now, revise to make sure the character’s heart does grow two sizes larger! Download the FREE Winter Writing with Kids 2011 here. My story won “The Help children’s story contest! Read more about this family story written by Darcy Pattison. By the way, there’s an app for the Grinch! This is brilliant! Thanks so much! 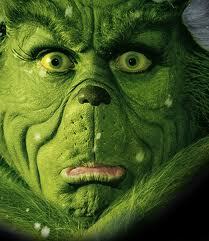 I am now going off to do the Grinch test on my WIP! And congratulations on winning the children’s story contest!